PT Asuransi Jiwasraya (Persero) - Jiwasraya is a long standing state-owned company in Indonesia, running business in life insurance industry. Jiwasraya is completely owned by the government. Jiwasraya was formed on 31 December 1859 and initially registered as Nederlandsch Indiesche Levensverzekering en Liffrente Maatschappij van 1859 (NILLMIJ). After several changes of its name and status, the name of PT Asuransi Jiwasraya (Persero) officially launches in 2003. Jiwasraya is based in Jakarta and its operations are divided into 14 regional offices spread across Indonesia. As of December 2016, these regions gave Jiwasraya a total of 71 branch offices, served by 13,475 insurance agents as well as 1,135 employees. PT Asuransi Jiwasraya (Persero) now supported by 1 subsidiary company; PT Mitrasraya Adhijasa. According to PT Asuransi Jiwasraya (Persero) Annual Report 2016 as cited by JobsCDC.com, Jiwasraya succeeded in posting excellent financial performance in 2016. Jiwasraya recorded total revenue of Rp 21.12 tillion in 2016 or 152.15% from Rp 13.89 trillion targeted in the RKAP 2016. Referring to its annual report, total revenue in 2015 amounted to Rp 11.06 trillion. Profit realization achieved Rp 1.72 trillion or 224.72% from Rp 764.46 billion targeted in the RKAP 2016. Total assets in 2016 amounted to Rp 38.62 trillion, growth by 51.01% from Rp 25.57 trillion in 2015. Male or Female with the minimum age of 21 years old. Holds education at least Senior High School or equivalent (SMA/SMK). Have driving license class A/C (SIM A/C). JobsCDC.com now available on android device. Download now on Google Play here. Please be aware of recruitment fraud. The entire stage of this selection process is free of charge. 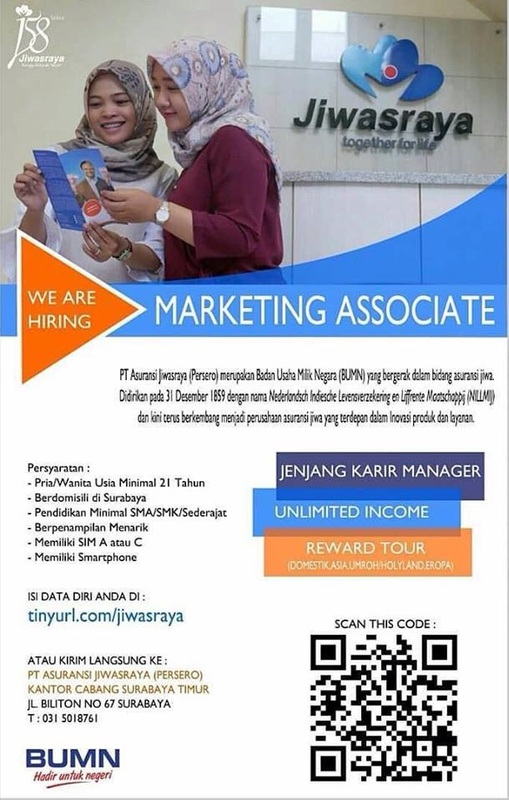 PT Asuransi Jiwasraya (Persero) - Fresh Graduate Marketing Associate Jiwasraya March 2018 will never ask for fees or upfront payments for any purposes during the recruitment process such as transportation and accommodation.